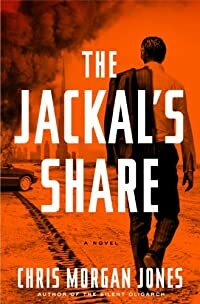 The Jackal's Share by Chris Morgan Jones: Synopsis and Online Purchase Options. Synopsis (from the publisher): A murder in a Tehran hotel leaves the London art world spinning. The deceased, beloved at home as a proud dealer in antiquities, now stands accused of smuggling artifacts out of Iran for sale in the West. But despite the triumphal announcements of the secret police, there is something perhaps too tidy in the official report — given that no artifacts have been recovered, no smuggling history discovered, no suspects found. Half a world away, Darius Qazai delivers a stiring eulogy for his departed friend. A fabulously successful financier, Qazai has directed his life and wealth toward philanthropy, art preservation, and peaceful protest against the regime of his native Iran. His fortune, colossal; his character, immaculate. Pleasantly ensconced in the world of the London expatriate elite, Qazai is the last person anyone would suspect of foul play. Yet something ominous is disrupting Qazai's recent business deals, some rumor from his past so frightening to his American partners that they will no longer speak to him. So Qazai hires a respectable corporate intelligence firm to investigate himself and clear his reputation. A veteran of intelligence work in the former Soviet Union, Ben Webster soon discovers that Qazai's pristine past is actually a dense net of interlocking half-truths and unanswered questions: Is he a respectable citizen or an art smuggler? Is his fortune built on merit or on arms dealing? Is he, after all, his own man? As he closes in on the truth of Qazai's fortune — and those who would wish to destroy it — Webster discovers he may pay for that knowledge with the lives of his own family.